As has been reported by Aquarius Channelings WE DID IT! “It has been confirmed by the Council of Elohim that we now have more than 144,000 people upon the Earth that are at least 5th level initiates and who have achieved and are now living in the frequency of Christ Consciousness. Fifth level initiation is referred to as the “Resurrection”. This demonstrates full mastery over the pull of matter. We completely return to the Monad and merge with the Group I AM while retaining a physical “light body” form. This is the attainment of 5th dimensional consciousness which is characterized by the experience of oneness. Gillian says ~ Bill’s eBook “The Great Awakening” describes the process undertaken by this brave light warrior/light worker to break through the control grid and center himself in his heart chakra – to ignite and activate the love reality of Source energy – All That Is – on Mother Earth. As you will see his journey was not an easy one. He had to contend with energies filled with denial and non-acceptance of his inner realizations concerning the great shift and awakening taking place during the 1982-2012 “nano-second” in time described by the Pleaidians. Bill has requested that his eBook be released without charge to all who are interested in reading his story and receiving the assistance required at this time to open the heart chakra and participate in the ascension. We have included the link below for you to download this important and timely work. For those of you who can afford to do so, we have enclosed information in the back of the ebook concerning how you may make a donation for this work. Please know that all contributions are gratefully accepted with appreciation, thankfulness, and love. 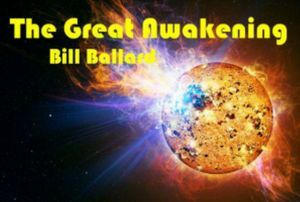 This entry was posted in Article, Ebook, Links, reblog and tagged 15 June, 2012, Bill Ballard, Disclosure, Earth, Great Awakening, news, spiritual, Spiritual evolution, The Great Awakening, The release of the E-Book by Bill Ballard and Gillian Grannum, World. Bookmark the permalink.